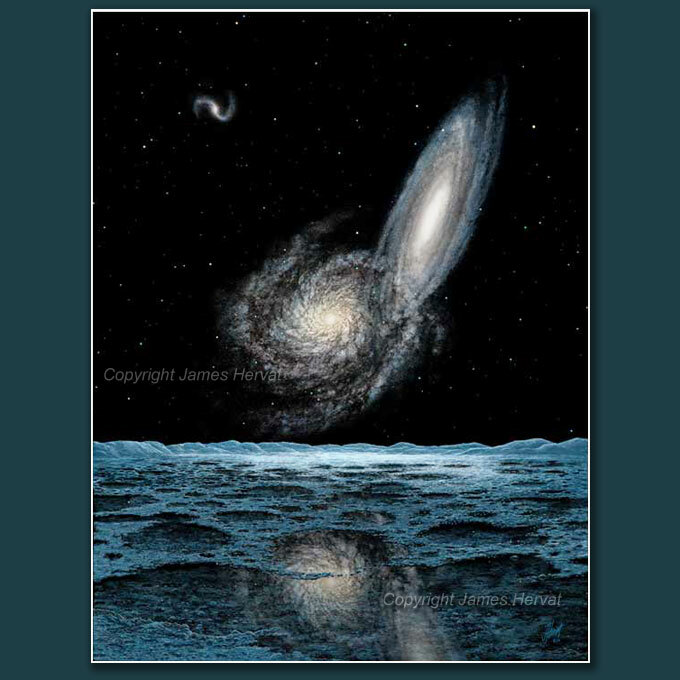 Galactic Merger" by James Hervat - Some cold, unknown planet provides a vantage for witnessing galaxies in collision. Galactic Merger (2009) - From the surface of a small planetary body located within a cluster of galaxies, we witness the collision of two neighboring galaxies. These titanic events, which play out over millions of years, are fairly commonplace throughout the observable universe. Our own Milky Way galaxy is on such a collision course with the Andromeda Galaxy. High-quality reproductions of all the artwork in this gallery are available from my secure Print Store. They are offered in a range of sizes, printed on paper, canvas or other print substrates. They can be ordered unframed or you can choose from a selection of framing and matting options. Items are usually shipped in 2-3 business days and come with a 30-day satisfaction guarantee return policy. Please see the PRINTS page for more information and a link to the Print Store.